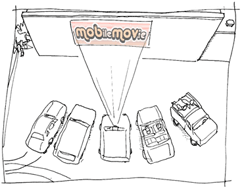 We are the global guerrilla drive-in movement bringing back the forgotten joy of the great American drive-in. Thanks to the wonders of modern technology, what used to be a dark and decrepit warehouse wall springs to life with the sublime sights and sounds of a big-screen movie. Best of all, the MobMov is free. Joe Crawford blogged this at 6:42am in 2008 in March. The 20th was a Thursday. You are reading this 11 years later. Comment. There is one comment Tweet. Send email. It has hashtags→ los-angeles movies .